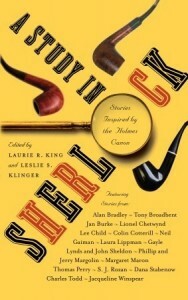 Review: In the Company of Sherlock Holmes edited by Laurie R. King and Leslie S. Klinger – Escape Reality, Read Fiction! The Sherlock Holmes stories by Sir Arthur Conan Doyle were recently voted as the top mystery series of all time, and they have enthralled generations of readers and writers! 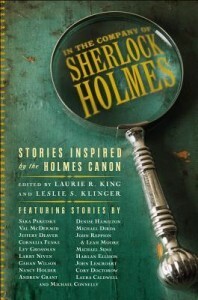 Now, Laurie R. King, author of the New York Times-bestselling Mary Russell series (in which Holmes plays a co-starring role), and Leslie S. Klinger, editor of the New Annotated Sherlock Holmes, have assembled a stellar group of contemporary authors from a variety of genres and asked them to create new stories inspired by that canon. Inside you ll find Holmes in times and places previously unimagined, as well as characters who have themselves been affected by the tales of Sherlock Holmes. The game is afoot again! This second collection of stories inspired by Sherlock Holmes is the followup to the editors’ 2011 collection, A Study in Sherlock. Just as in that previous effort, this collection contains some stories that are actual Holmes pastiches, taking place during the time period covered by original canon, some are extensions of the Holmes we know into time periods not covered by Conan Doyle, and some are stories inspired by the Great Detective but don’t include him personally. There are also a couple of stories told using unusual perspectives or narrative conceits. 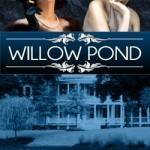 Several of the stories play with the question of whether Holmes was or was not a “real person”. Like all collections, this is a mixed bag. Some of the stories are worthy successors. Some are memorable. Some are just a bit cute. Your mileage, of course, may vary considerably from mine. Three stories in particular stick with me for different reasons. My favorite story in the bunch is Dunkirk by John Lescroat. It is the one that haunts me after the book is closed. Dunkirk is not a Holmes story per se, it is one of those stories that speculates on Holmes’ life after he retired to the Sussex Downs to take up beekeeping. I read it mostly as a tribute to the men who took their small craft and little fishing boats from Dover to Dunkirk in the late Spring of 1940 to rescue the entire British Expeditionary Force that was trapped on the French coast in the wake of the Nazi overthrow of France. We see the crew of one little ship, operating on little food and less sleep, running back and forth day after day to pick up 60 men at a time from certain death. The perspective is that of a 72 year old Holmes, under his Sigerson nom-de-plume, who felt that he must do something to combat evil in this second World War, just as he did in the first. In the end, it is his connection to humanity that he feels, and we feel. The final touch of the heroism medal left for Sigerson and never claimed is pure Holmes. The story in The Memoirs of Silver Blaze by Michael Sims relates the tale of the theft and recovery of the racehorse Silver Blaze, as told in the Conan Doyle story of the same name, from the perspective of the horse. While the method of retelling this particular story seems a bit twee, it actually works pretty well. After all, the horse was the murderer in this one, and it seems only fair that he get the chance to tell the story from his point-of-view. It does feel that we know a little bit more about what happened by getting the story straight from the horse’s mouth. So to speak. My final favorite is of the “stories inspired by” school of Sherlockiana. In the case of The Adventures of My Ignoble Ancestress by Nancy Holder, it’s hard to tell how much of this is based on the author’s true family history, and how much is pure invention, which makes it that much more fun. The author’s ancestress was part of a Sherlock Holmes case, The Adventure of the Beryl Coronet. While her many-times great aunt was eventually discovered to be the thief of that Beryl Coronet, she disappeared after the theft was discovered and was assumed to have run away in disgrace. While investigating the truth of the tale, the author is able to lay to rest not only the ghost Mary Holder, but also some much more recent ghosts of her own. Escape Rating B: The stories in this collection that I enjoyed, I really enjoyed. Especially Dunkirk. But looking back over my review of A Study in Sherlock (here) shows me that there just aren’t as many in this collection as there were in the previous one. On that other hand, I particularly want to note that this collection, In the Company of Sherlock Holmes, is the inspiration for editor Leslie Klinger’s lawsuit to place all of the pre-1923 Holmes stories into the public domain in the U.S. (The laws in Britain are different, and the entire canon is public domain across the pond.) The Conan Doyle Estate blocked publication of this collection until Klinger had his day in court. And was vindicated. (For the complete history of the case, look at Free Sherlock).